State Patrol photo of flood damage near Bartlett in southwest Iowa. The assessment of the flood damage to Iowa roadways continues. 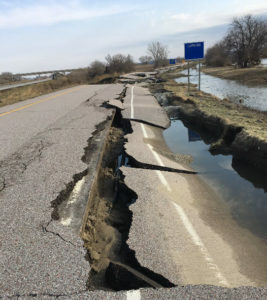 Iowa Department of Transportation director Mark Lowe recently touring flooded areas on the western side of the state and says some of the damage is not major. Then there are areas where a lot of work will be needed. “The southern segment of 680 where you get to the downstream side where the water has come across the road and runs over that downstream side, it’s like a lowhead dam. And it just corrodes, erodes the material underneath. We’ve got quite a few places along 680, some spot places along 29 and certainly places along 34 where we are going to have to go back and replace — if not shoulder — substantial segments of the roads,” according to Lowe. He says they are in the process of completing the testing to determine exactly what needs to be done to each segment of roadway. “We’ve got more to learn in the next few days,” Lowe says. Once the testing is done, they will start getting repairs made. “There’s going to be quite a bit of focus in the next 180 days on going through all the spot repairs we need to make — as well as taking on all the major repair and replacement projects. And we still haven’t been able to get the water of the road on 29 south of 2 and down to the boarder,” he says. Lowe says the spring repair job that was going to be a bit more than normal after a brutal winter has turned into a big project. “What’s ironic is, we were looking at the damage that we had just coming out of the winter where you’ve got so many potholes and other things opening up because of all the freeze-thaw cycles. We had just approved through our Transportation Commission, a $12 million amendment for pavement rehabilitation,” Lowe says.